Many Nigerian women have stormed the capital city of Abuja to beg Atiku Abubakar to concede defeat after his loss at the presidential polls. According to a Vanguard report, Nigerian women on Friday had a two million woman rally in Abuja to appeal to Atiku Abubakar, the presidential candidate of Peoples Democratic Party, PDP, in the last election to congratulate his opponent, Muhammadu Buhari of the All Progressives Congress to concede defeat. The Independent National Electoral Commission had declared Buhari of the APC winner of the keenly contested having scored the highest votes. However, Atiku has vowed to go to court, alleging that he was rigged. 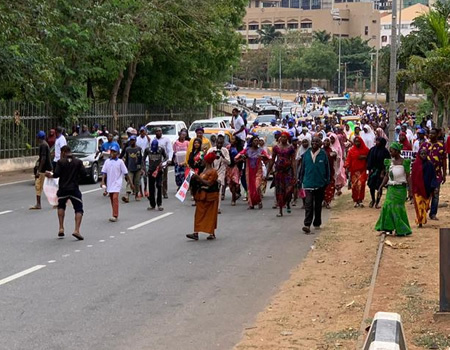 The women, under the aegis of Two Million Woman Rally for Democracy in Nigeria, Peace and Stability kick-started their match at the Unity Fountain down to Hilton Area before proceeding to the Force headquarters, Eagle Square and back to Unity Fountain. Onuche also called on Buhari not to disappoint Nigerians who have overwhenmingly voted him for another term. With this configuration in mind, the foremost opposition candidate in the election, Alhaji Atiku Abubakar of the Peoples Democratic Party (PDP) not to shy away from playing this role. This requires that he is seen, ab initio, as putting the interest of Nigeria first, a requirement that has been made even more important by unscrupulous persons waiting in the wings to exploit any contentions over the polls to their own dark advantage. While we remain apolitical, we are encouraged by the assessment of international election observation missions, which in-spite of their earlier tilt in favour of Atiku prior to the election, have come out to declare that the conduct and the outcome of the poll was satisfactory to them. We suggest that Atiku takes time to slow down and listen to his foreign allies who have now concluded that even the Parallel Vote Tabulation they used as control showed that the PDP candidate was fairly defeated. We use this opportunity to passionately appeal to President Buhari that Nigerians did not repose their confidence in him for nothing. The second term they have given him in office should not become a basis for miscreants to destabilize the country in the guise of protesting for their candidate that fairly lost in an election. While Mr. President must continue to urge his supporters to be civil in their jubilation at his victory and contemplative of the tasks ahead, members of the opposition must also be reminded that Nigeria has laws and the law enforcement agencies must be so instructed. Once again, we want to appeal to our father and friend, Alhaji Atiku Abubakar to do the needful now. Pick up the phone and call President Buhari let’s sustain the peace and stability of our nation.